The Mekong is one of the world’s major rivers, weaving together the land and indigenous cultures of Tibet, southern China, Myanmar, Thailand, Vietnam and Laos. It’s also one of the best ways to get around in Southeast Asia. In Laos, a journey down the Mekong is not a mere travel adventure pursuit. It’s an experience of daily life. Here in one of Asia’s poorest countries, many highways exist only in theory. 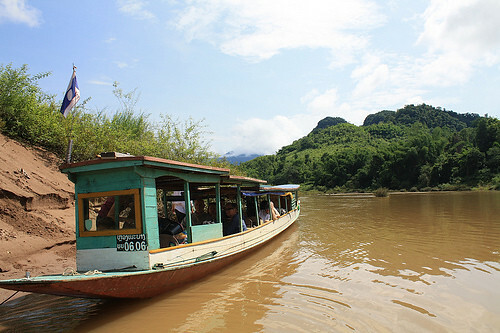 The Mekong is often the sole means of transportation. We began our river journey in Luang Prabang, one of Southeast Asia’s loveliest cities (more to come soon on this gem!). We boarded an old, wooden river boat that sits about eight passengers. The boat is a low-rider, with your head just peaking out above the river once you are aboard. Passengers sit two-by-two, giving everyone in the boat a good view for the scenic ride. Our boat journey was a full day, 8-hour ride and along the way, we experienced some of the most dramatic scenery Laos is said to offer. Karst Mountains towered above us. Stilted, bamboo villages peaked out of jungled mountains. And the windy, beige ribbon they call the Mekong is the center of life. The Mekong River seems to bring everyone together. We watched fisherman hide from the sun under bamboo hats while casting their nets in the muddy river. We saw herds of buffalo wading at the shoreline. In the mist of the early morning, we watched in awe as a group of wild elephants gathered at the water’s edge to take a mud bath. And as the day unfolded, women gathered at the water’s edge to beat their laundry on the rocky shore aside a group of tangerine-clad novice monks taking an afternoon dip. After experiencing some of the most spectacular river terrain my eyes have seen, we arrived at our final destination – the rustic, riverside village of Nong Kiau. 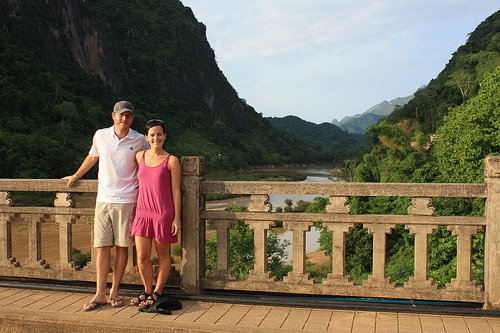 From here we’d spend two days soaking up the spectacular scenery of the Mekong River. 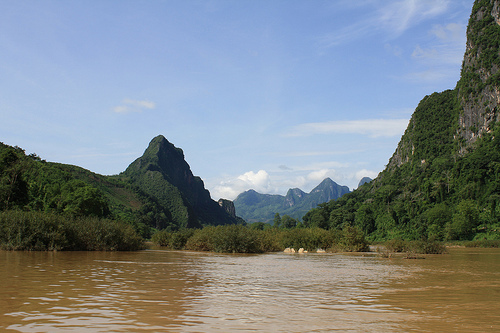 Nong Kiau is a little settlement surrounded by vertical limestone mountains, dense forest and, of course, the Mekong River. There is a handful of bamboo bungalows tucked into the mountainside, where we made our home for a couple days. With hardly any other sounds other than the songs of hundreds of birds and cicadas, we found this to be the single most peaceful place we’ve encountered in all of our journey. Here in serene Nong Kiau and on our scenic boat ride down the Mekong, we became even more enamored with the unspoiled gem of Laos.